October 1, 2015 - Scandinavian Airlines (SAS Scandinavian Airlines System) begins collaboration with Cityjet on regional jet services. 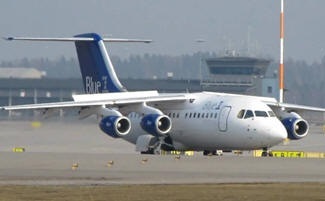 As part of this collaboration, Cityjet is also acquiring 100% of the shares in SAS subsidiary Blue1. SAS’s strategy is to offer frequent travelers a broad network with frequent flights to, from and within Scandinavia. To adapt the size of the production to traffic flows SAS utilizes hired capacity, known as a wet lease, with smaller regional jet and turboprop aircraft. In line with this strategy, SAS has entered into an agreement with Cityjet on the wet lease of eight new Bombardier CRJ900s. SAS already operates twelve regional jet aircraft of this type through its subsidiary, Cimber. “We are looking forward to working with Cityjet to further expand our regional route network and thereby strengthen SAS’s offering to frequent travelers. The eight brand new CRJ900s from Cityjet will provide us with efficient and flexible production of regional flights that will complement SAS’s production on the larger traffic flows,” says Rickard Gustafson, President and CEO at SAS. The new aircraft, which each have 90 seats and are painted in SAS colors, will be put into service from March 2016 on routes and at times when there is a need for smaller aircraft. The wet lease agreement is for three years and covers eight Bombardier CRJ900s with an option on a further six aircraft. “This is a fantastic opportunity for Cityjet to work with a leading airline such as SAS. We are looking forward to a long-term cooperation, where we will deliver a high level of quality in terms of efficiency and customer service for SAS passengers. We are also keen to benefit from the experience and knowledge of the Nordic airline industry that the acquisition of Blue1 will give us,” says Patrick Byrne, Chairman of the Board at Cityjet. As part of this collaboration, Cityjet is acquiring 100% of the shares in SAS subsidiary Blue1. The sale of Blue1 will lead to a marginal impact on SAS’s income before tax, cash and net debt. The Group’s income after tax during Q4 2014/2015 will be negatively impacted of around MSEK 90, primarily due to write down of capitalized loss carry forwards. The sale and the new wet lease agreement are expected to increase cost efficiency and flexibility. Cityjet is a European airline that was founded in 1992 and is headquartered in Dublin. Cityjet has a fleet of 18 Avro RJ85 jet aircraft and it operates over 680 flights per week throughout Europe.